Eminent film director Shekhar Kapoor had all the praises for defence minister Manohar Parrikar for getting IFFI to Goa while I&B minister Arun Jaitley thanked Kapoor for suggesting Goa as a permanent venue. Recalling the initiative then chief minister Parrikar had taken to get IFFI to Goa, Kapoor said it would have not been possible without the defence minister. Kapoor, who was speaking as the chairman of the international jury at the 46th IFFI, said Parrikar had instantly upheld the suggestion he made about Goa and worked very hard to get it here. “It’s your festival Mr Parrikar”, he said to smiling defence minister in the first row. Information and Broadcasting Minister Jaitley, in his inaugural speech, however thanked for the excellent suggestion to take IFFI to Goa permanently. The international film festivals are known by name of the place where it is held, he said, like Cannes or Berlin. “Goa was a right place to be suggested for the festival and the suggestion has been proved right in last 11 years”, he said. “You need to be fearless to be a politician, but you need to be completely fearless to be a creative person”, said Kapoor while speaking about creativity in the cinema. 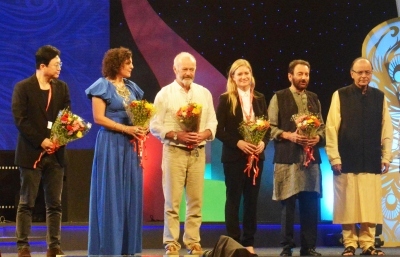 He also introduced the team of international juries, who would select the winners of Golden and Silver Peacocks of IFFI after watching all the international entries. Julia Jentsch, German Actress; JEON Kyu-hwan, Korean Director; Michael Radford Director and Screenwriter from UK and Suha Arraf, Palestanian Director, Screenwriter and Producer are the juries this year. They were felicitated at the hands of information and broadcasting minister Jaitley. What are cinematic contributions of Anil Kapoor to have him inaugurate this cinematic event? He is a third rate Bombaya commercial stuntman. In fact, Shekhar Kappor who is known all over the world for his cinema and acumen would have been a better choice.